"Music gives them life, and they give life back to music." Music gives us life, and we give life back to music. In a world very much like ours, there are those who listen to music, and then there are those who truly listen to music. Since the dawn of the Classical period, these people have called themselves Music Masters; those who gain fantastical powers from the sound of music. Centuries later, and one disco-loving Michael Kay would discover himself to be one of those very same Music Masters. But how long will his once peaceful sanctity of sound last? Little does Michael know that there are allies, enemies, and Zero Beat abound, as he begins the auditory quest to discover what it truly means to be a Music Master. Music Masters has not been tagged yet. Help others find Music Masters by tagging it! 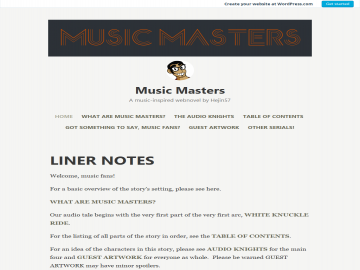 Music Masters has not been recommended yet.